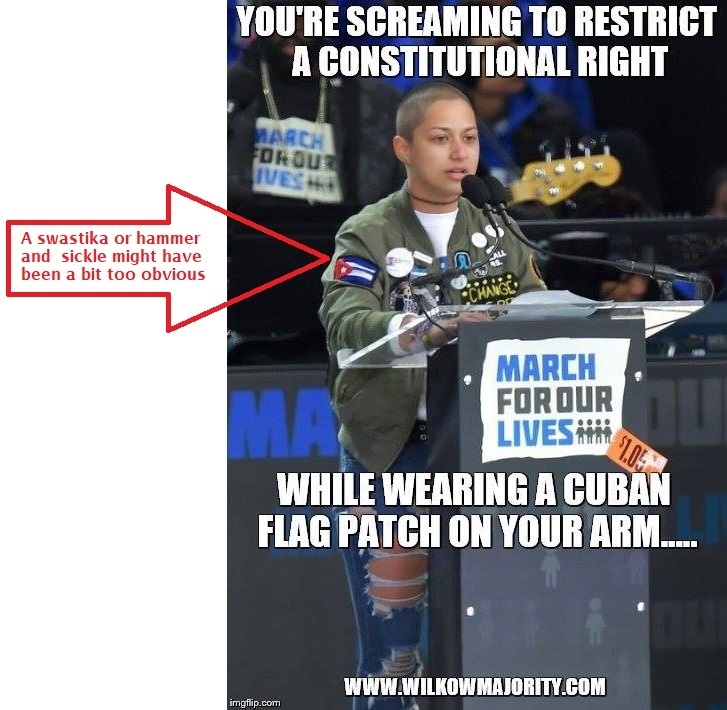 Saturday’s March for Our Lives was a phony spectacle, but a glimpse of reality showed through when teenage totalitarian Emma Gonzalez took the stage to bark moonbattery on behalf of the liberal media establishment that granted her 15 minutes of fame. Her jacket prominently featured the flag representing the communist regime that rules Cuba. The Spanish word vencido, by the way, translates into “defeated” or “surrendered.” And indeed, “the acrid odor of gunpowder and blood” very, very rarely reached Guevara’s nostrils from anything properly describable as combat. It mostly came from the close-range murders of defenseless men (and boys.) Carlos Machado was 15 years old in 1963 when the bullets from the firing squad shattered his body. His twin brother and father collapsed beside Carlos from the same volley. All had resisted Castro and Che’s theft of their humble family farm, all refused blindfolds and all died sneering at their Communist murderers, as did thousands of their valiant countrymen. If it were up to the March for Our Lives crowd, only the government would have firearms, just like in Cuba. They choose Emma Gonzalez as a spokesmoonbat because she is all broken up about a gun being used at her school by a mentally ill person to kill teenagers. The irony tops even her fellow teen tyrant David Hogg complaining that being required to carry a clear backpack infringes on innocent students’ constitutional rights. On tips from Chuck A and Varla.